Katherine was honored to have three of her baskets chosen for the 19th Juried Art Show at the Schack Art Center in Everett, WA. The show opened on June 19 and will end August 2. It is a biennial exhibit of Northwest artists in a wide variety of mediums. 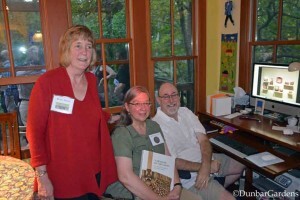 This year’s jurors were Jan Hopkins, Ken Rowe and Joan Pinney. You can view the complete list of artists and images of the work on the Schack website. 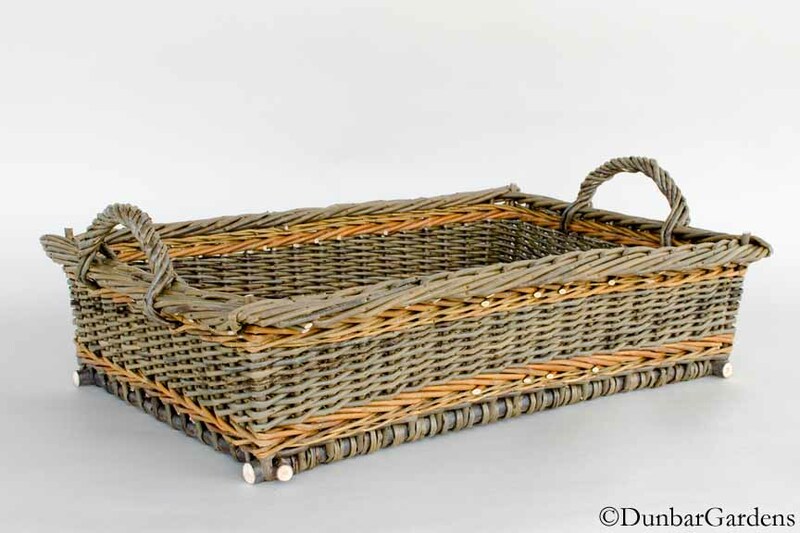 There are two basket makers in the show with Dorothy McGuinness in addition to Katherine. One of Dorothy’s pieces “Threshold” was awarded Second Place in 3D works. 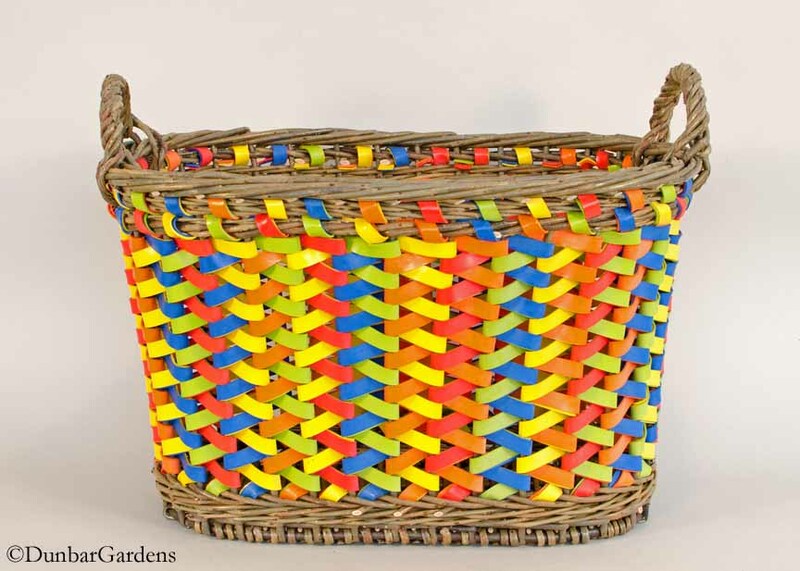 Katherine received an Honorable Mention for her basket “Pi(e)” seen in the image above. 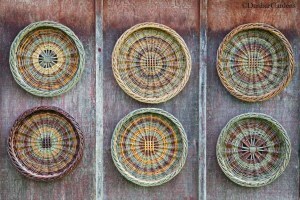 Of course, anyone involved with basketry or fiber arts will recognize the name of juror Jan Hopkins. It definitely adds to the honor of having work chosen for the show. Katherine appreciates the opportunity to display her baskets in an art venue like the Schack. Since her work emphasizes the functional element, it is not often she gets her work juried into exhibits. Katherine works almost exclusively with willow, but occasionally she experiments with other materials. 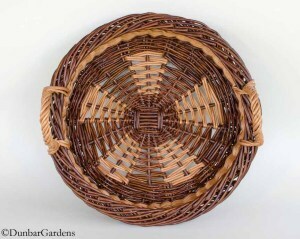 The third basket in the show titled “Slingshot” has rubber strips used in the side weavers along with the willow base, stakes, border and handle. She uses a zig zag weave with the strips doubled up to get a different look inside and out. We hope people have a chance to see the exhibit before it closes. Thanks again to the jurors, gallery director Carrie Collver and all the staff at the Schack. 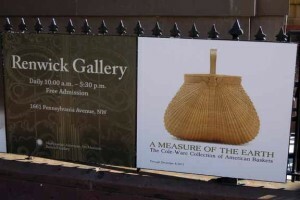 Katherine traveled to the other Washington to visit “A Measure of the Earth: The Cole-Ware Collection of American Baskets” at the Renwick Gallery of the Smithsonian American Art Museum. The first time we ran into the federal government shutdown. This time around the doors were open for visitors. She was able to tour the exhibition with Steve Cole who collected all the baskets. Hearing Steve’s stories about finding the basketmakers and collecting the baskets was a real treat. They also visited with exhibition curator Nicholas Bell, and all three posed for a photo next to Katherine’s Irish Potato Basket which invites visitors in to view the baskets. 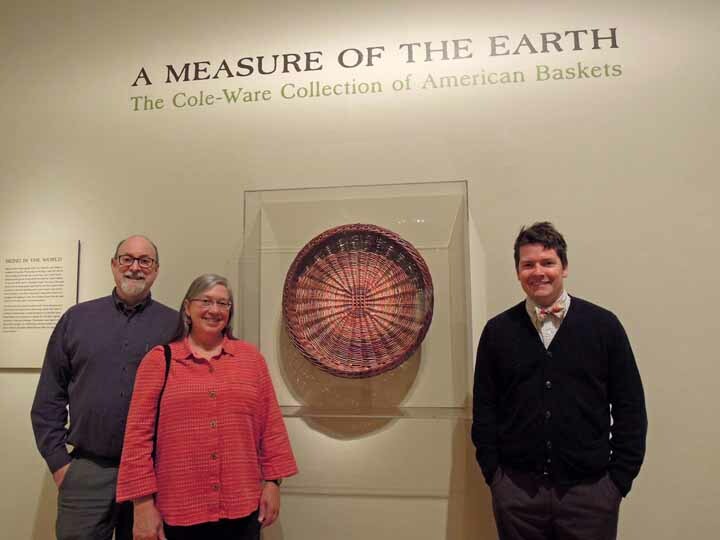 collector Steve Cole, basketmaker Katherine Lewis, curator Nicholas Bell at Renwick Gallery next to a Lewis willow basket. Photos weren’t allowed in the exhibition but Katherine did take a photo of the “Hands-on gallery” from the adjacent museum gift store. 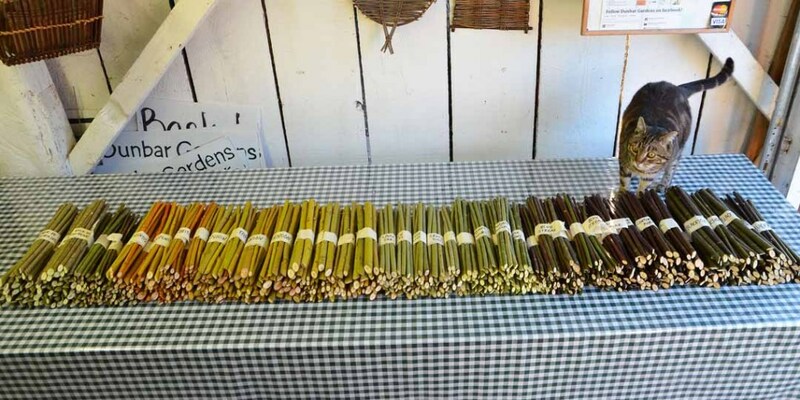 You can see Katherine’s fitched willow market basket on the right end of the table. 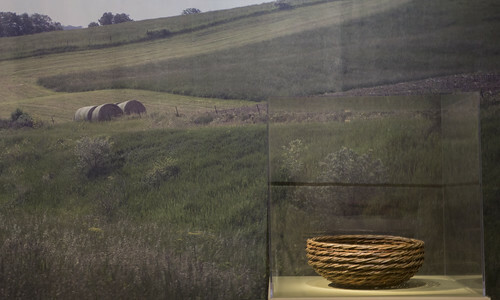 The baskets in the hands-on area are tethered to the tables with a cord, and visitors are encouraged to pick up the baskets to feel and view them in detail. Another nice surprise was seeing one of Steve’s photos of the Dunbar Gardens basket willows used in this area (on the far left in the photo). 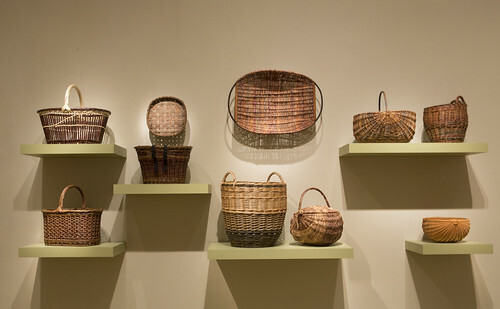 Katherine has six willow baskets in the exhibition in addition to the “hands-on gallery” basket. Fortunately the Smithsonian American Art Museum posted a set of photos of the exhibition to their Flickr photo gallery. 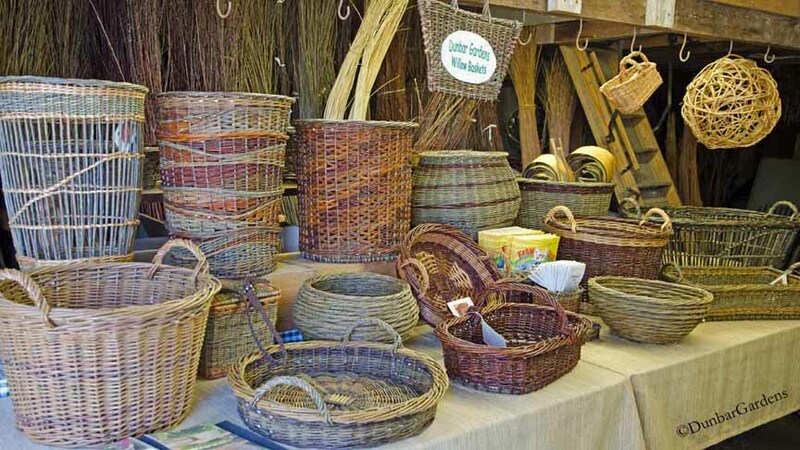 In this photo courtesy of the Smithsonian you can see four of Katherine’s baskets in a display with other willow baskets. Katherine had a wonderful time in Washington, DC. 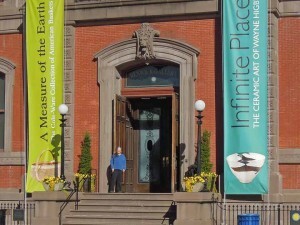 Although she did visit other museums, she visited the Renwick all three days she was there. She saw Steve Cole there all three days as well; proof that he spends a lot of time sharing stories with not only the basketmakers but other visitors as well. Steve was kind enough to spend a little more time with Katherine and her friend and basket buddy Sharle who flew out from Washington for the weekend. 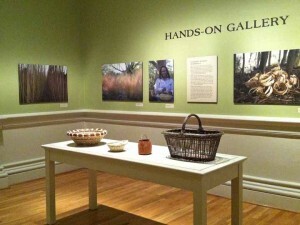 Katherine is honored to have her work included in this wonderful display of American basketry. There are over 100 baskets by 63 basketmakers working with a variety of materials. 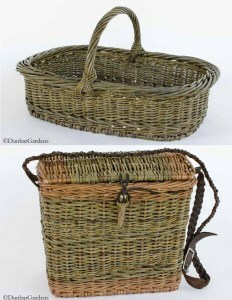 If you are interested in baskets, the exhibition is definitely worth a visit. You can find more information and links at the Smithsonian website. It runs through December 8, 2013. 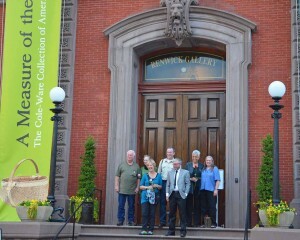 We received our invitation to the opening reception of “A Measure of the Earth: The Cole-Ware Collection of American Baskets” at the Smithsonian American Art Museum’s Renwick Gallery. We were excited to go and made our reservations. As we posted earlier Katherine Lewis had several baskets in this prestigious exhibition. The week before the opening someone asked if the possible federal government shutdown was going to effect our plans. “They are not going to shut the Smithsonian museums!” The following Tuesday morning we found out that Congress considered museums non-essential services and they did indeed shut them down. We had non-refundable reservations so we went hoping that an agreement would be reached quickly and we could still attend the exhibit. We arrived in Washington, DC on Thursday, October 3 as planned which was the same day as the Capital was locked down as a result of an incident that involved a woman being killed there by police. We walked down to the White House unaware of the event and were surprised at the heavily armed presence of law enforcement. 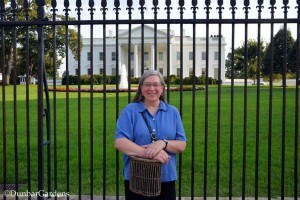 Katherine decided to protest in front of the White House for more basketry anyway. 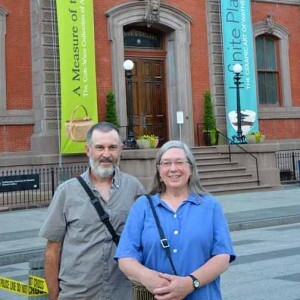 The Renwick Gallery is at the corner of Pennsylvania Ave. and 17th St. NW just down the block from the White House. Some of the basketmakers had arranged to meet up in front of the Renwick Gallery at the scheduled time of the opening despite the shutdown. Because of the earlier incident there was actually police tape preventing us from even getting to the front door of the Renwick. It was fun anyway to meet some of the basketmakers and their families and friends who showed up to celebrate. People shared stories and tips on what they were up to on their visits to our nation’s slightly dysfunctional capital. While we were standing near the Renwick, a large motorcade assembled and left the White House grounds. 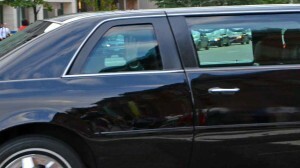 The police blocked traffic in front of the Renwick and the motorcade drove out and we could see Vice-President Joe Biden waving from the back of one of the limousines. Unfortunately he didn’t stop to let us in to see the show though the police then took down the yellow barrier tape. On Tuesday when we found out the Smithsonian would be closed due to the federal government shutdown, we had sent emails to our congressional representatives about Katherine’s story. On Thursday after our arrival in Washington, DC we were pleasantly surprised to get a call from our Washington 2nd District Representative Rick Larsen’s office. Rep. Larsen’s staff arranged for us to visit his office in the Rayburn Building. He and his staff were interested in our unique story and sympathetic to our disappointment in not getting in to see the exhibition. 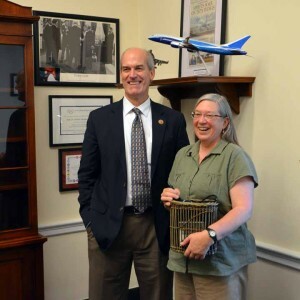 Steve took the photo of Katherine and Rep. Larsen while his staff member Bryan Thomas was taking a photo as well. They were laughing because Bryan was saying to make sure that Katherine’s basket purse was in the photo. Although we were unable to see the exhibition, we did have the opportunity to finally meet the basket collectors, Renwick curators and staff, and more of the basket makers represented in the collection at a reception hosted by Steve Cole and Martha Ware. 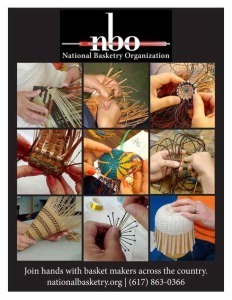 All the basket makers were presented with the exhibtion catalog by Elizabeth Broun, Director of the Smithsonian American Art Museum and the Renwick Gallery. Of course, the federal government shutdown ended the next week and the exhibtion opened without the fanfare, and will stay open until December 8. One nice consolation was a set of photos of the exhibition that the Smithsonian posted to Flickr. 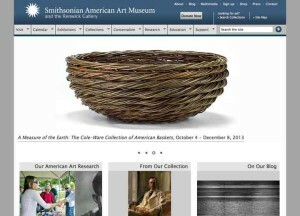 It was also pretty cool to see one of Katherine’s baskets used to promote the exhibition on the Smithsonian’s website. Having your work represented in an exhibition at the Smithsonian will probably only happen once, so Katherine is headed back to the other Washington to see the exhibition on November 8. After all persistance is necessary if you are a traditional craft artisan.